Friday night lights are back again. The class of 2019 is a special group in Nebraska as many of the top in-state players will go on to play college football at the Division I level. Nebraska currently has verbal commitments from four of the states’ top five players. Throughout the fall, we'll chronicle what you need to know about each player and their season so far. Nick Henrich represented a huge recruiting win for Nebraska when he announced that he was joining the 2019 class in July. Not only is he the best player in the state of Nebraska, but he is one of the best inside linebacker prospects in the country. It was especially important for the new staff to land him to show they meant business about keeping the best talent home. Henrich is an excellent prospect with good leadership qualities. On Sept. 14, Burke takes on Omaha North in one of the best rivalry games in the state. The games between these two schools are always highly competitive and there will be lots of future college talent on display. Burke will be looking for revenge as North won 29-28 last season in the playoffs, going on to win the Class A state title. The Bulldogs started their season with a 49-28 win over Lincoln Southeast. Henrich had 11 tackles (2 for loss) and blocked a punt. This week Omaha Burke hosts Millard West. Snodgrass is a do-everything player for his York team. He has potential at multiple positions but his ultimate college spot is unclear. Last season on defense he recorded 90 tackles, 14.5 tackles for loss, three sacks, three pass breakups, one interception and blocked three field goal attempts. Sept. 14 is a busy day for rematch games around the state. That day features Omaha North-Omaha Burke but York also takes on Skutt Catholic that night. Last season, York beat Skutt 31-0 to win the Class B state title. This year, the Dukes have to travel to Omaha to take on Skyhawks. Snodgrass completed all seven of his pass attempts for 85 yards and a touchdown in York's 55-14 win over Alliance. He also rushed seven times for 38 yards and two touchdowns, and had four tackles (one for loss). This week, York hosts Blair. Piper is a good prospect who stars on both the offensive and defensive line for Norfolk Catholic. He projects as a defensive lineman right now for Nebraska. His quotes to me after he committed to Nebraska will make him an instant fan favorite. The Knights will face five playoff teams from last season. Their toughest game is against Ponca, which finished 2017 at 10-1. That game will be a tough road test late in the season before the state playoffs begin. Anything can happen when you start the season off with a rivalry game. Norfolk Catholic dropped its season opener to Pierce, 48-29. This week, the team will look to bounce back with a home game against St Thomas Aquinas. Nelson was the first player to commit to the class of 2019 for Nebraska. He did so back on June 24, 2017. Nelson is a Husker legacy as both of his parents are Nebraska alumni. His father, Chris Nelson, was an All-American wrestler for the Huskers in the early 1990s. His grandfather, Ken Parish, was the head football coach at Cozad during the 1960s and 1970s and has been a big part of Nelson’s life on and off the field. Last season, the Bearcats’ only regular season loss was to McCook in a nail-biter, 17-14 at home. This year Scottsbluff will look to avenge that loss when they face off against McCook on Oct. 19. In the season opening game on the road against North Platte, the Bearcats won 41-20. Nelson had three solo tackles and also carried the ball twice on offense. Nelson will try to help his team get a winning streak started as they host Hastings this weekend. 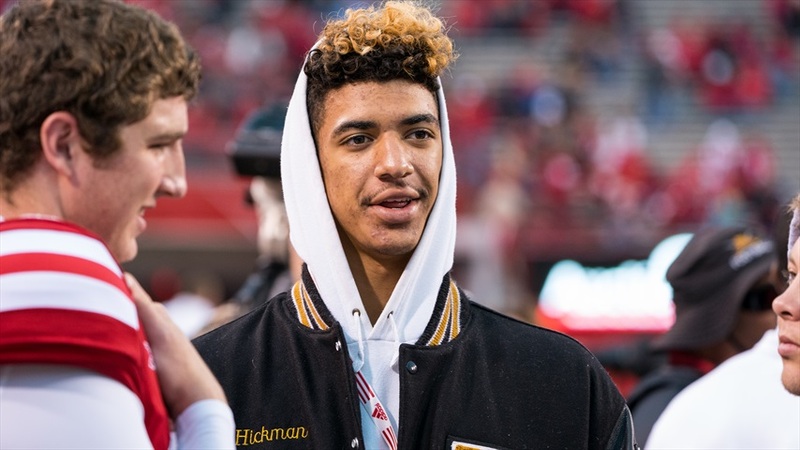 Omaha Burke tight end Chris Hickman during a visit to Nebraska last October. Hickman is the only prospect of the top five in the state who has not already verbally committed to Nebraska. The Huskers are recruiting him hard and he has made multiple trips to Lincoln. Hickman is a versatile player who could play either tight end or defensive end in college. The Bulldogs started their season with a 49-28 win over Lincoln Southeast. Hickman had 5 tackles in the game. He was targeted a few times on offense but didn’t record a reception. This week Omaha Burke hosts Millard West. This week, I’ll be taking in the York home opener against Blair. The defending state Class B champions have a number of potential walk-on targets for the Huskers. After seeing his increase in size at Friday night lights this year, I'm curious to see Nebraska commit Garrett Snodgrass‍, a 3-star (HV Rating: 85.3) athlete, back in action.